John Paciga is a fellow Garden State musical kindred spirit who never stops impressing us with his confidence, character and maturity. We strongly encourage all of you to get on board and support this stellar new video (did we mention it was self-directed?) and also check out John’s full-length album, No Alibi. 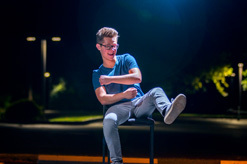 With a songwriting savvy so well honed and abilities that profoundly belie his years, it’s clear the sky’s the limit as he moves forward during his collegiate years! Please feel free to contact Andy Gesner and the HIP Video Promo team at (732)-613-1779 or email us at info@HIPVideoPromo.com. You can also visit www.HIPVideoPromo.com or www.JohnPaciga.com for more info on John Paciga. For info about other John Paciga videos, click HERE.